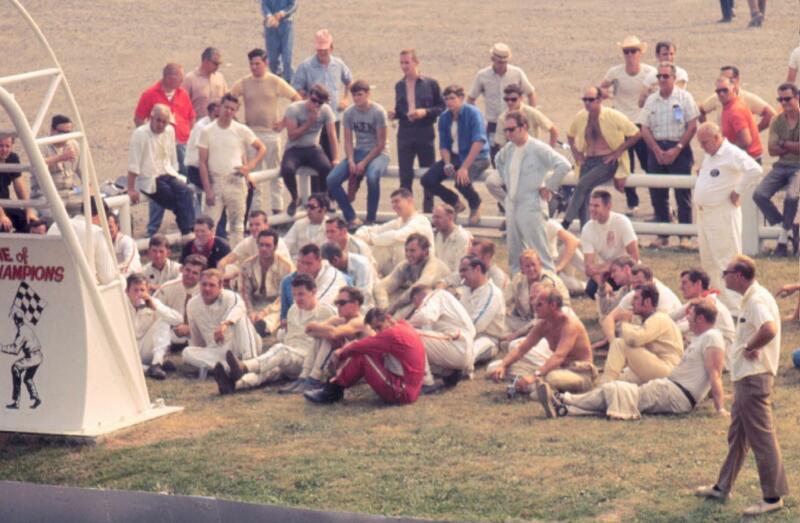 This photo of the drivers meeting before the 1969 (pretty sure '69) Oswego Classic is great. What an amazing collection of early supermodified racers. Of course, we've made a pastime of identifying these guys. If you can identify any of these guys (or yourself) please let me know. 6 is Jim Cheney (sipping soda), 7 is Fred Graves (big ears), 8 is Bob Hunter, 9 is Mike Stone, 10 is Ron Wallace, 11 is Jim Gray, 12 is Norm Mackereth?, 14 is Bob Stelter, 16 is Ollie Silva (sunglasses), 17 is Baldy Baker?, 18 is Nick Rowe (head is turned), 19 is Kempton Dates (glasses), 20 is Paul Baumhauer or Joe Hylwka, 22 is Andy Brown, 23 is Johnny Benson Sr. or Eldon Schrader, 25 is Walt Riley, 26 is Eldon Schrader or Tony Lavati, 27 is Jack Conley (standing), 28 is Red Barnhart, 30 might be Todd Gibson or Billy Hughes, 31 is Jack Greedy?, 34 is Jim Shampine, 35 is Warren Coniam, 36 is Bentley Warren, 37 is Ken Andrews, 38 is track photographer Bill Hartwell, 43 is Doug Duncan? 51 is Bill McClure? Download this high resolution bitmap if you need a better look.